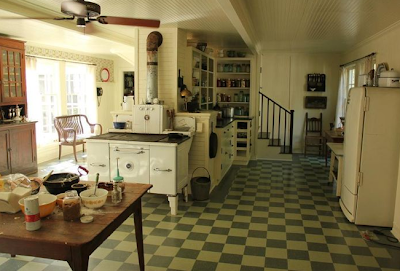 Makin' it in Memphis: Lusting after "the Help" sets. This weekend I went to see "The Help." I have since read that the theatre that I went to (Paradiso in East Memphis) sold the most tickets to the movie of any theatre nationwide. I don't doubt it one bit. It was the third weekend since it was released and the movie was still packed! OK first off, Skeeter's parents house. The whole house was a WOW (Southern plantation style mansion, beautiful woodwork) but this kitchen just was a love. The floor (did I mention I have checkered linoleum?) was fab, the table and chairs are fab, the hoosier cabinet in the back is a definite WANT - no NEED. Hilly's kitchen was turquoise and the table in the center was almost exactly this table. How funny! I got this back in July before I had seen the movie. 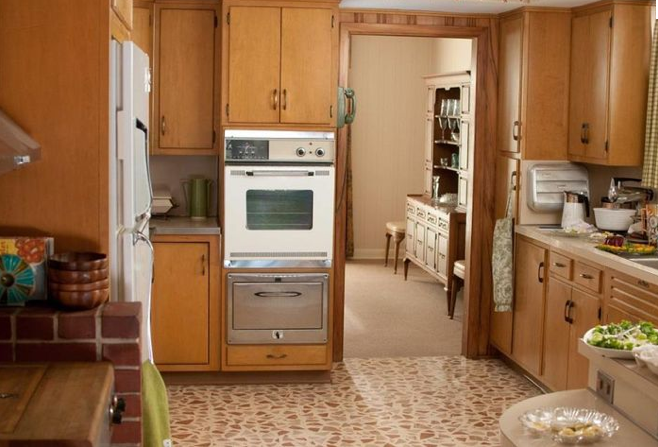 OK ours was WAY worse but the floor, the cabinets, the counters, the paneling. The light in the other room of that picture (the one that is off because it was broken, you can see it peeking down from behind the header to the first room) was actually in Elizabeth's breakfast room. What this tells me? 1) The set designers did an amazing job and 2) I probably was born in the wrong decorating era. No wonder I love antique stores. Great post. I've read the book but have not seen the movie yet. The main reason I want to see the movie is the sets and you've confirmed that. Thanks!